Anna Nordqvist watches her tee shot during the third round of the Airbus LPGA Classic. MOBILE, Ala. (AP) - Anna Nordqvist moved into position for her third victory of the year, shooting her second straight 6-under 66 to take the third-round lead Saturday in the Airbus LPGA Classic. The 26-year-old Swede, the winner in Thailand and Carlsbad, had a 16-under 200 total on The Crossings course at the Robert Trent Jones Golf Trail's Magnolia Grove complex. "All I can do is put myself in a position to have a chance tomorrow and I felt like I've done that," Nordqvist said. "Last year, I was in the final group and I was playing well and there was a lot of people coming from behind, so I know this golf course, you can never relax. You always have to keep pushing forward and trying to make birdies because if you don't, someone else will." Nordqvist played the front nine in 5-under 31, birdieing Nos. 2-5 and 9, and added a birdie on the par-5 16th. She has only one bogey - on her fourth hole Friday - in 54 holes. 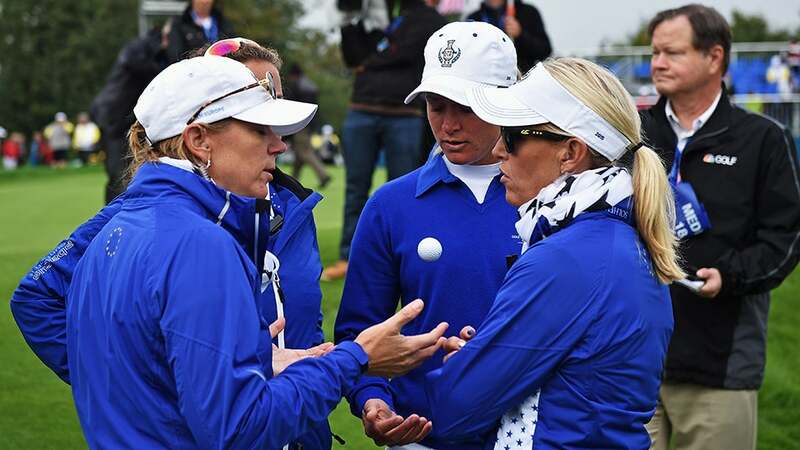 "I felt very confident and very comfortable," Nordqvist said. "Got off to a really good start and just tried to keep the momentum. Had a pretty good finish the last three holes, so I'm very happy with the day." She set the course record last year, shooting a third-round 61 en route to a fourth-place tie. "I definitely know I can score on this course," Nordqvist said. Catriona Matthew, the 44-year-old Scot who led after each of the first two days, was a stroke back after a 70. She bogeyed three of the first five holes to drop to 10 under, then birdied five of the last 15 - including three of the last four. "I obviously got off to a terrible start with the three bogeys when everyone else is making birdies," Matthew said. "Just knew there was a lot of chances there on the back nine if I could just hang in and try to start hitting greens again and give myself chances. Made four birdies on the back nine, so not the greatest round, but didn't play myself out of it." "I think you come into every tournament wanting to win it, so that was my goal, to come here and win," Matthew said. "I've been playing well all year, just not holing any putts. So if I can get my putter going, things can go well." Second-ranked Stacy Lewis, the 2012 champion who needs to finish solo third or higher to take the top spot in the world from Inbee Park, was third after a 66. Park missed the cut Friday. "It was a pretty solid day," Lewis said. "Definitely could have been a lot better, so I like that going into tomorrow that I didn't play the best round today. I left quite a few out there, but still made a lot of birdies and got the ball in the hole." She won the North Texas LPGA Shootout three weeks ago for her ninth tour title. Michelle Wie, Jessica Korda and 18-year-old Charley Hull were tied for fourth at 13 under. Wie shot 66, Korda 69, and Hull 71. Wie had a bogey-free round. "I felt like there's a lot of low scores out there, so I was just trying to keep up with everyone else, making birdies," Wie said. "Hopefully, I can have another low one tomorrow."